Situated on Margate's seafront, we arrived at Ctrl, Alt, Esc to play Frankenscape and were welcomed by our games master and her relatives who run this friendly, family business. We exchanged stories about other games we’d played before being invited to watch a short video on the rooms rules and regulations. Genius inventor Alec and his assistant Tricity have gone missing and nothing in his workshop is where it should be. The strange force they have invented has the ability to create life itself …but only when lightening strikes! A thunderstorm is imminent but has only been forecast to last 90 minutes. With Alec and Tricity nowhere to be found, we as a team needed to finish his work in time or risk forfeiting this groundbreaking discovery. Led by our games master to a doorway and directed down some stairs into an outside area, our GM then proceeded to unexpectedly close the door behind us. We were suddenly on our own and hadn’t even made it into the games main space! A daunting prospect that did well to affirm our new found isolation and curiously elevated our excitement for the generous 90 minutes ahead. Having eventually accessed the main space we began to investigate our surroundings, initially with just a few props to examine which did well to determine the games starting point. Cltl, Alt, Esc pride themselves on their rooms technological elements and as we are mostly lock-and-key traditionalist - at least preferring a mixture of the two, we were a little dubious of how reliable we'd find the new-age puzzles here. We need not have worried though, as after breaking the seal upon completing the first round of riddles, the stream of robust and dependable technological elements flowed faultlessly without any hiccups. Malfunctioning tech props have been an issue in rooms previously, but the sturdy, well-maintained technology here all worked flawlessly with some rather impressive additions we’d not seen elsewhere. 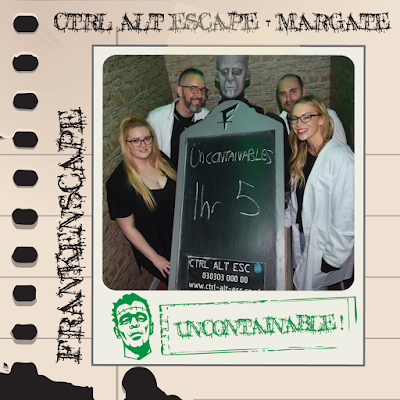 The puzzles themselves varied in their difficulty and as the space opened up the continuation of goodies to scrutinise only increased, keeping all team members busy with various tasks to undertake. Our only minor niggle would be that some elements appeared to be timed releases, rather than offered in line with the teams pacing. So no matter how fast your progress, you could be found wasting time attempting a puzzle that could not be resolved due to required elements not yet being available. As the game is non-linear, it could become confusing as to what tasks you or other players had already completed. Soundbites signalling the completion of tasks did often result in a frantic hunt around the room to locate what had been achieved or unlocked. There were a few welcomingly unexpected and mildly sinister moments and we particularly enjoyed the original, non-strenious physical tasks which broke up the familiarity of the cognitive puzzles. Frankenscape offers a favourable balance of the two keeping the space entertaining as well as a mentally stimulating. Despite a couple of moments of confusion, overall we thoroughly enjoyed Frankenscape for its reliable props, abundance of engrossing puzzles and the clever fanfare of its big, impressive finale. It’s definitely Putting On The Ritz by setting a new escape room standard with its quirky mechanical additions and has awoken a new division away from the traditions of an original escape game. Even with its minor faults Ctrl, Alt, Esc have succeeded in creating a monster of a room with their very own next-gen escape experiment.